In the aftermath the defeat of Napoleon I at Waterloo the allies established the new Kingdom of the Netherlands as agreed by the treaty of Chaumont in 1814. This kingdom would include territories of former Dutch Republic and most parts of the Austrian Netherlands. It was agreed that this new state would become a buffer zone that would prevent future French hegemony on the continent. At the southern frontier of this kingdom a series of fortresses were established and expanded. These defensive positions were named for the Duke of Wellington hence the Wellington barrier. The main focus of this defensive concept would lie at the southern border region but several fortresses remained vital: Antwerp, Gent, Liège, Huy, Maastricht. From the start Dutch rule was unpopular in the French-speaking southern part of the Kingdom. Notably the provinces in today’s Wallonnia did not favor the policies of William I. On the 25th of August 1830 a rebellion against Dutch rule rose up in Brussels. The root causes of this uprising will not be fully addressed but Belgian revolutionary forces were able to assert control over Brussels, Liège (Luik) and Namen. The Dutch army disintegrated and units from the northern part of the Netherlands were called although some strong points remained under firm control. The citadels of Antwerp, Maastricht, Venlo and Luxemburg were able to repel rebel forces. The French government applauded the apparent split of the Kingdom since it would remove the fortress barrier and a new Belgian government would offer friendly diplomatic relations with France. The British Empire also favored Belgian independence since the powerful union of the Netherlands was becoming an economic rival. The Russian Empire and Prussia did not approve but were unable to send a military expedition because of upheavals in Poland. Citizens in Antwerp initially did not support the Belgian uprising since the city had enjoyed a remarkable economic revival under King William I. But when skirmishes ensued and the citadel’s commander General Chassé opened fire on the city thereby destroying houses and inflicting civilian casualties relations quickly deteriorated. It remains unclear what sparked this bombardment but the use of heavy (coastal) artillery against the city is considered to be out of proportion and in fact could be labeled as war crime. The Dutch forces continued to occupy the citadel since they were able to receive reinforcements and supplies by the river Scheldt. Diplomatic efforts increased but a final agreement did not seem possible. The French diplomat Talleyrand devised a plan that would carve up the southern Netherlands but met refusal. King William I invaded Belgium during the so called ten-day-march and was able to swiftly defeat Belgian armies. French intervention on behalf of Belgium prevented a total defeat. The Dutch gained a more favorable negotiating position but one year later the French army of the North (Armée du Nord) intervened and laid siege to the citadel of Antwerp under the command of Marshal Gérard. 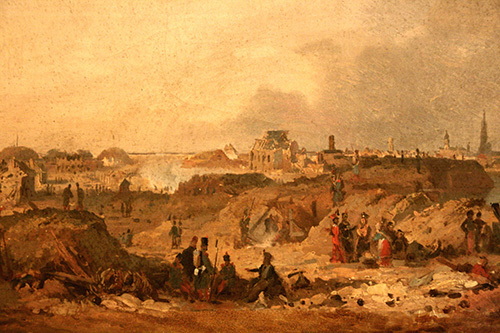 The siege commenced on November 15th and ended on December 23th 1832 when the walls of the citadel were breached by French sappers and the Dutch garrison ran out of supplies. The forts of Liefkenshoek and Lillo however remained under Dutch control until the final treaty of 1839 was signed. The Netherlands were able to maintain control over the river Scheldt. This will prove to be a crucial caveat for future Belgian defense policies. The city of Antwerp refused to accept a French monument commemorating the siege of 1832; instead it ended up in Tournai (Doornik).